Plummer had some comments on his time with the Nighthawks: “I couldn’t speak more highly about the Nighthawks organization. The coach knows what it takes to get to the next level and I wouldn’t be where I am, without him. You need someone behind you that knows the hockey world, and he does. The organization gives you all the tools that you need to succeed, all you need to do is bring your effort. Two practices a day, workouts, video, and affordable housing. The organization does it right. Tristan is one of many college commitments from the 2017/2018, Nighthawks team. More announcements will follow. Drew is one of Anna Maria’s many high end commitments for the upcoming season. The first year NCAA Division III program will be coached by David McCauley who has had great success in the junior hockey world and will no doubt have his team competing immediately. Drew is one of many college commitments from the 2017/2018, Nighthawks team. More announcements will follow. 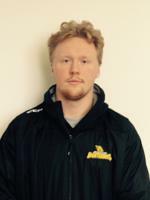 Simsbury, CT – The Connecticut Nighthawks are proud to announce that, two year Nighthawk, Jason Diamond, has made his commitment to Becker College for the fall of 2018. The Nighthawks leading scorer had a breakout season and established himself among the league’s elite. Diamond averaged a point per game during the regular season with 23 goals and 21 assists in 44 games. He added a goal and two assists in two playoff games. 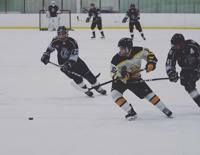 Head Coach and GM Brett Tryder said, "Jason was our most consistent forward this season. He worked hard and made the most of every practice. He showed that he has the ability to produce while playing responsibly in all three zones. College coaches are looking for guys that play a 200 foot game and Becker will get that with Jason. I am happy for Jason and I believe that Becker College is a perfect fit for him. The CT Nighthawks are pleased to announce the commitment of Tristan Goodwin to Johnson and Wales University located in Providence, RI. "Our organization is very happy for Tristan on his commitment to Johnson and Wales. Tristan has been a key goal scorer for our team this season and has worked extremely hard both on and off the ice to reach his goal of becoming a student athlete at the Collegiate level," states Junior Nighthawks Head Coach Jeff Tory. Tristan adds "I'm very excited to be playing for Johnson and Wales next year. Thanks to everyone in the Nighthawk organization for everything along the way, glad I could be a part of this first year team and proud of our accomplishments." Tristan becomes the second player to commit to a college program from the Nighthawks in its inaugural season. The team has several other players on the verge of accepting College offers and look forward to announcing those shortly. ©2019 CT Nighthawks / SportsEngine. All Rights Reserved.